Anodized Aluminum, Flat Ring Riveted, Chain Mail Coif - this item is being discontinued and is priced to sell !! 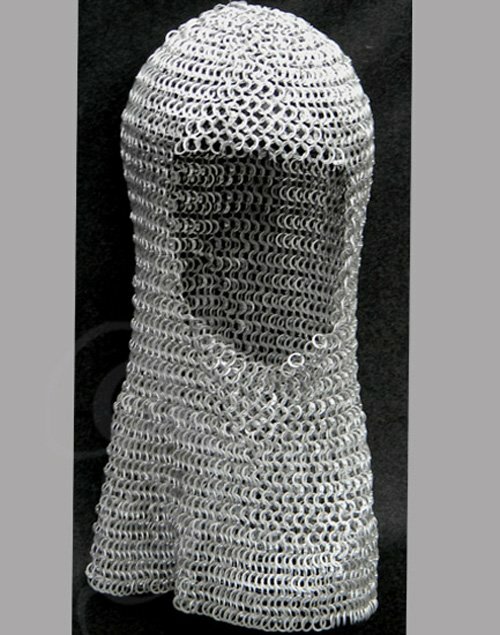 The medieval chainmail coif(hood) is made of hundreds of rings in the medieval 4 in 1 pattern. 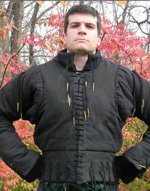 The chainmaille coif has an open front section to give you great visibility and drapes over the entire neck onto the shoulders. 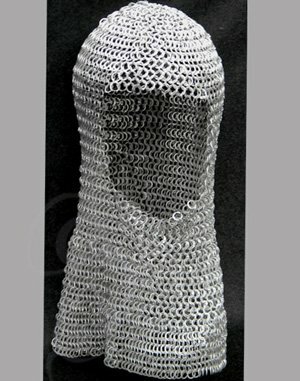 The chainmaille coif includes the aventail (neck cover) and thus covers the sides, back and front of the wearers head. Our standard size coif has a forehead circumference of 26 inches. 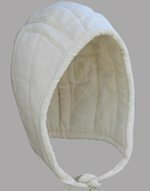 With an overall length of 18"-20" and bottom edge circumference of 56", it fits almost everyone. The chainmail rings have a 9 millimeter inner diameter (just under 3/8") and are made with 16 gauge wire. 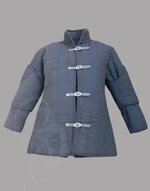 Anodized Aluminum Construction - Our chainmail is made of anodized aluminum. Steel chainmail is very heavy. Aluminum chainmail is about one third the weight of steel chainmail. 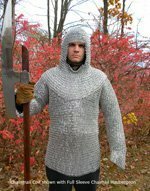 Steel chainmail is prone to rust and requires a lot of care to keep it rust free. Aluminum chainmail does not rust. The two major drawbacks of aluminum are a tendency to corrode and it is weaker than steel, however, we offer anodized aluminum. Anodization is a chemical process that makes the aluminum corrosion resistance and increases the strength of the aluminum. Many buildings are contructed of annodized aluminum.